It was a lazy weekend for both the films released last Friday. Both the film failed to impress the audience and does attack them to the theatres. Let’s start with the film Junglee and check how did it perform on the first weekend. The Vidhyut Jamwal starrer film collected 2.8 Crores on the first day and went on to score 5.05 on the second day, while on the Sunday, it scored the highest as 6.05 Cr on the final day giving a meagre collection at the box office on the first weekend. The growth on Sunday was around 36 per cent, but it did not help the film to achieve a decent figure at the box office on the first weekend. So, with these figures, the 1st-weekend box office collection for Junglee reached to around 13.85 Crores, which can be called still a decent amount for the movie for many reasons. However, the weekday’s collection would be low which will only help the movie to collect less than 50 Crores as its lifetime collection. 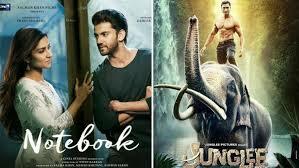 The other film released on the same day called Notebook ended on the bad note on the first weekend. Despite the good reviews by most of the critics, the film failed at the box office. The collection on an average on a daily basis scored around one crore per day, which ended up to give a very low figure for the film. All thanks to the low star value and the improper promotion of the movie, it failed to impress the audience so forget about attracting them. As per reports, the 1st-weekend box office collection for Notebook went on to score around 3.45 Crores. The collection during the first week will also be low for the movie.